Rooted deeply in behavioral theory and knowledge of Patterson’s coercive cycle, Parent-Child Interaction Therapy (PCIT) works with both caregivers and children to restore balance and positivity to family dynamics. 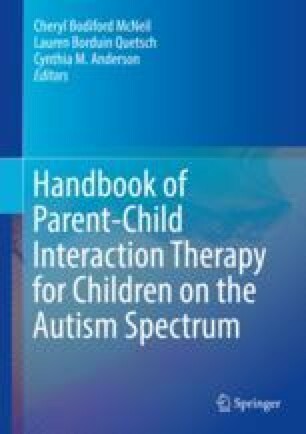 PCIT uniquely implements live coaching to change maladaptive interactional patterns within caregiver-child dyads, with therapists collecting observational data to inform the progress of therapy. Due to the specialized skillset necessary to delivery this highly specified therapy, standardized training requirements and a certification process guide the practice of PCIT internationally. This chapter reviews the prerequisite education, basic training, clinical competencies, and case consultation required to become a PCIT Therapist. Additional recommendations are provided for supplemental training in autism spectrum disorders (ASD), including knowledge of diagnostic methods, connection with available ASD resources, and identifying ongoing educational outlets. Considerations for PCIT-ASD training are suggested.